A note before getting started. This earring was created primarily using a stacked quilling tool. It is very easy to make and if you would like to make one for yourself so that your earrings come out exact, you can find the free tutorial here on the website. If you prefer not to do so, you can find a household cylindrical object or dowel that is the same diameter as I call for in the pattern These instructions also assume a basic understanding of quilling and creating the basic shapes. If you need to learn or brush up on your skills, you can find free instructions by following the link to the tutorial here. For this tutorial you will need 4 different colors of 1/4" quilling paper. I created this design using Quilled Creations paper in grape, crimson, ivory and dark grey. All products are available for your convenience in our Paper & Products Shop for purchase. Using your quilling tool and a 4.25" strip of color D, make 2 tight rolled coils. 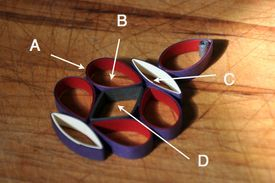 Using your stacked quilling form (2" diameter tier), first roll a tight coil ring with an 8.5" strip of color B. Glue to secure when you reach the end. Seamlessly join an 8.5" strip on color A. Glue to secure when you reach the end and carefully remove from the form. You will need to make 5 for each earring (10 total). Using the same 2" tier of your stacked tool, make another ring using 8.5" of color C and then seamlessly join an 8.5" strip of color A. You will need 2 for each earring (4 total). Once again using the 2" tier of your tool, make 2 ( one for each earring) tight closed coil rings with the 17" strips of color D.
Make sure that all your rings are tightly round with no gaps. Doing so will ensure the shaping process goes smoothly. Shape the 2 D rings into diamonds. It is not very important where the outer seam ends up - all sides will be hidden. Shape the 10 A/B rings into teardrops. I choose to place the outer paper seam near the point. Shape the 4 A/C rings into marquis shapes. Place the outer seam on one of the non pointed sides so it will be hidden when glued. You are done shaping and ready to glue. You should have a bunch of shapes ready to go like the ones pictured below. You are ready to assemble your earrings. Begin by placing a strip of glue on each side of a D diamond. Attach an A/B teardrop making sure that the point of the teardrop and the point of the diamond match up. Allow to dry before moving on to the other side. Attach all four teardrops in the same manner for each earring. Once the glue has dried completely, place a dot of glue between each base side of the teardrops as pictured below. Hold to secure. Attach the A/C marquis shapes to both the top and bottom of the earring using just a dot of glue on either point of the A/B teardrops as shown in the photos. Be sure to hide the seams of the marquis shapes. Place a few small dots of glue on the top of one of the marquis shapes and attach one of the remaining teardrops. Repeat with the other earring. Place a small dot of glue on the inside crease of the earring's top teardrop. Insert one of the small D tight coils and press in to secure. Repeat the process on the other earring to complete your pair. Allow the glue to dry completely before moving on to the finishing phase.